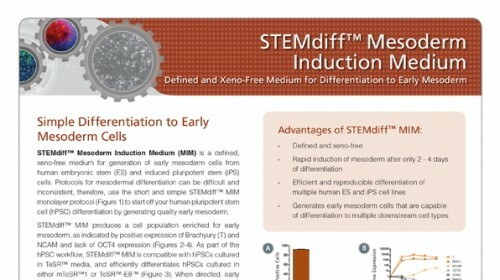 STEMdiff™ Mesoderm Induction Medium (MIM) is a defined, xeno-free medium for generation of early mesoderm cells from human embryonic stem (ES) and induced pluripotent stem (iPS) cells. 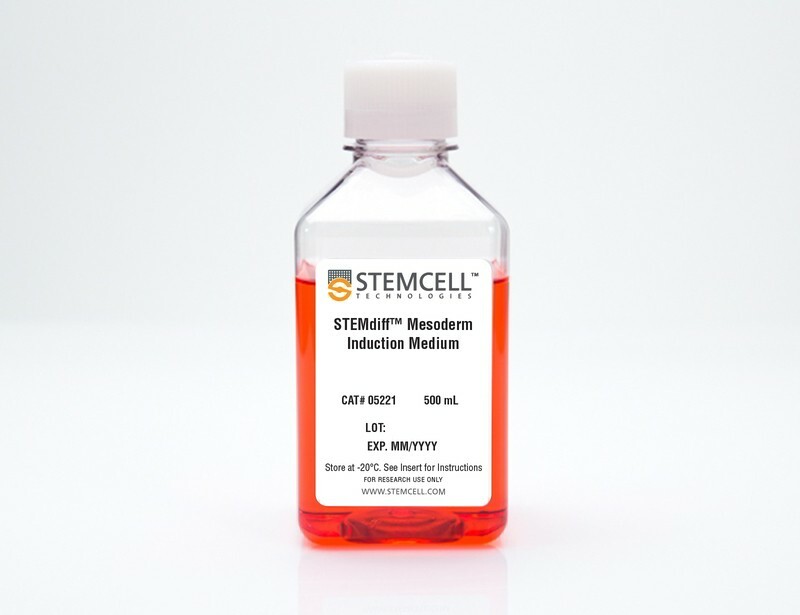 Protocols for mesodermal differentiation can be difficult and inconsistent, therefore, use the short and simple STEMdiff™ MIM monolayer protocol to differentiate your human pluripotent stem cells (hPSCs). 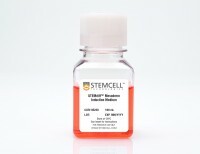 STEMdiff™ MIM is a complete medium that produces a cell population enriched for early mesoderm, as indicated by positive expression of Brachyury (T) and NCAM markers. 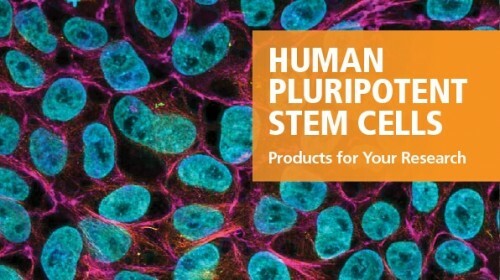 As part of the hPSC workflow, STEMdiff™ MIM efficiently differentiates hPSCs cultured in TeSR™ media. 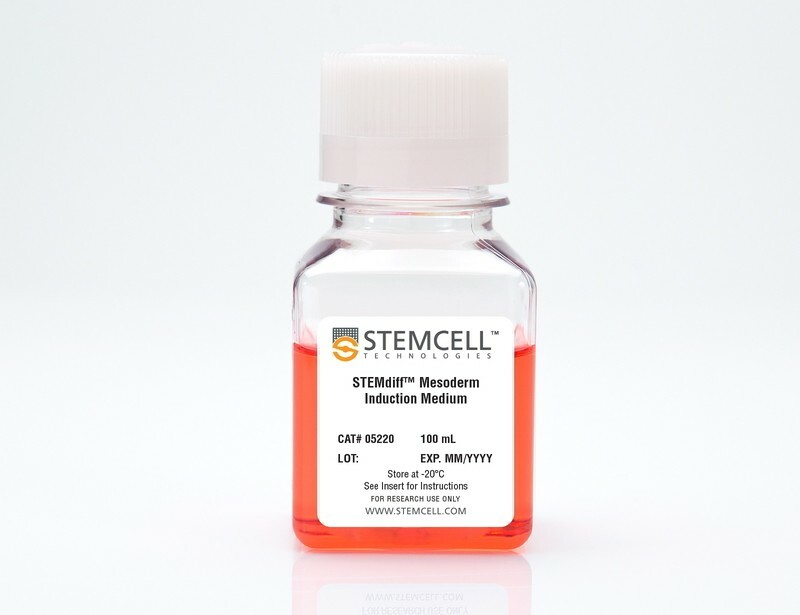 When directed, early mesoderm cells produced using STEMdiff™ MIM can be further differentiated to specialized cell types, such as osteoblasts, chondrocytes, adipocytes or endothelial cells. For more information, see the data below. On day 0, hPSC colonies are harvested and seeded as single cells at 5 x 10 4 /cm 2 in mTeSR™1 or TeSR™-E8™ and supplemented with 10 µM Y-27632. 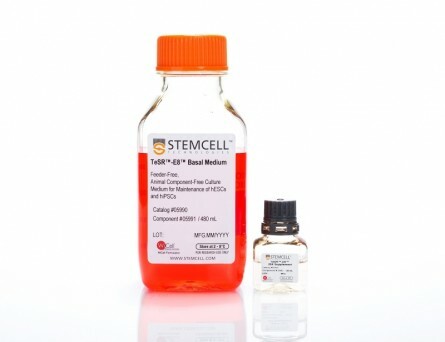 TeSR™ medium is replaced on day 1 with STEMdiff™ Mesoderm Induction Medium when cells are at approximately 20 - 50% confluency. 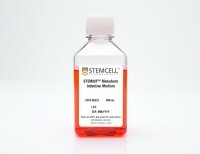 Cells are then fed daily and cultured in STEMdiff™ MIM (days 2-4). 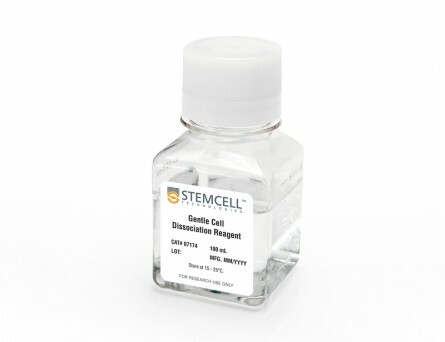 Cells can be transferred to downstream differentiation conditions between days 3 - 5 or collected on day 5 for analysis. (A) Data showing marker expression characteristic of the early mesoderm (positive Brachyury (T) expression and negative OCT4 and SOX 17 expression) on day 5 of the protocol. Data is expressed as a mean percentage of cells expressing each marker ± SD, n = 33 (T, OCT4), n = 5 (SOX17). 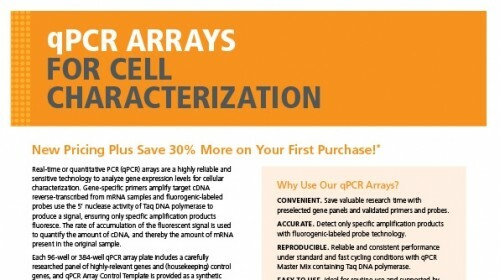 (B) Expression of undifferentiated cell markers (OCT4, SOX2, NANOG) and early mesoderm markers (T, MIXL1, NCAM), measured by quantitative PCR (qPCR) and normalized to levels in undifferentiated cells, n = 2. Representative flow cytometry plots showing the switch from (A) EpCAM + NCAM -/low in hPSCs cultured in mTeSR™1 to (B) EpCAM -/low NCAM + expression in STEMdiff™ MIM-treated cells (day 5). 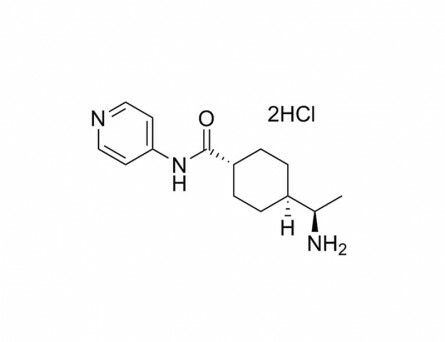 EpCAM -/low NCAM + expression is characteristic of the early mesoderm. 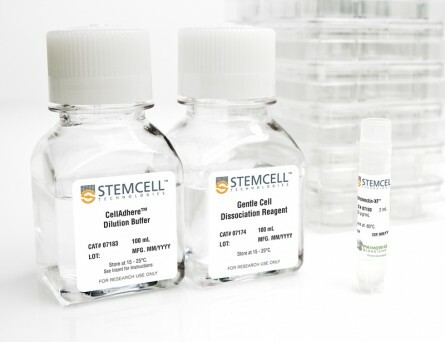 Expression of PDGFRα and KDR are low in both (C) hPSCs cultured in mTeSR™1 and (D) early mesoderm cells derived with STEMdiff™ MIM. 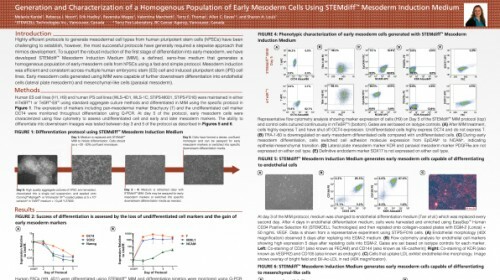 (A) Early mesoderm cells generated with the 5-day STEMdiff™ MIM protocol and subsequently cultured with MesenCult™-ACF develop mesenchymal stem cell (MSC)-like morphology, 40X magnifi cation. MSC-like cells can subsequently differentiate into (B) adipocytes (Oil Red O staining), 200x magnification, (C) chondrocytes (Alcian Blue staining), 100X magnification, and (D) osteogenic cells (Fast Red and Silver Nitrate staining), 40X magnification. 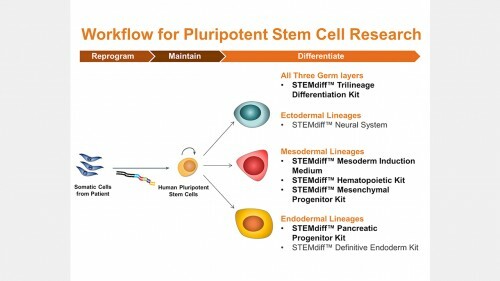 On day 3 of the STEMdiff™ MIM protocol, early mesoderm cells were switched to a downstream endothelial differentiation protocol based on Tan et al. (A) Differentiated cells display characteristic endothelial cell morphology and (B) are able to uptake Dil-Ac-LDL (red). Representative flow cytometry plots showing (C) 85.5% CD144 + CD31 + and (D) 87.6% CD105 + KDR + expression in differentiated endothelial cells.